Snipers in special units rely on long-range weapons tailored to the mission. However, they also require targeting optics that enable fatigue-free observation, clarification and precise acquisition of an object at great distances over longer periods of time. Hensoldt Telescopic Sights 3—12x56, 3—12x56 FF, 4—16x56 and 4—16x56 FF meet all the optical and ergonomic design demands placed on them by snipers. 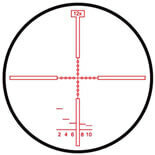 They are available with a reticle in the first (FF version) and second image plane. They deliver an outstanding optical image and are comparatively light weight, quickly ready for use and easy to use. In addition to military applications, Hensoldt 3—12 x 56 and 4—16x56 are also well suited for special police units and long range hunting. With T*® multi-coating exceed 90% total system light transmission producing a bright, high-contrast image. The increased transparency in the blue spectral range leads to improved visual performance, particularly under low-light conditions. reticle from over-illuminating the target image even at night. The control electronics are equipped with a memory function which guarantees that the same brightness level is used that was previously set. The lateral parallax compensation minimizes target errors and always ensures optimal focus. 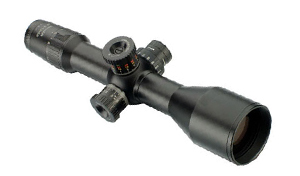 As with all Hensoldt riflescopes, it is watertight per ISO 9022-81 and nitrogen-filled.